I can't believe that the end of 2013 is already here... it went by crazy fast, right? I'm not sure about you, but 2013 was an interesting year for me. Nothing all that "big" happened in our lives this year, but I feel like that might be life's way of preparing us for some really momentous events and changes in 2014. There a few big things on the horizon that we are expecting: some great travel opportunities, visits with family and friends to celebrate weddings and graduations, and hopefully dipping our toes in the waters of home and dog ownership. And then, there is always the unexpected... and we are no strangers to that! So while it hasn't even started, 2014 is already shaping up to be a busy year. And I can't wait! Goodbye 2013 and cheers to 2014! 1. Run one more marathon (Alex's goal for his 30th birthday year). He did it! Alex completed the Chicago Marathon in October and finished with his personal best time. So proud! 2. Be more financially responsible by saving more aggressively for a house and keeping our credit card debt at a low/manageable level ALL year. Not to toot my own horn (toot toot! ), but I feel like we really killed this one in 2013... we have been incredibly conscious of spending, budgeting, and managing our debt and I think it has really paid off. Homeownership, here we come! 3. Read more books and watch less TV (one of my goals from last year that I didn't do so well with). I'm reading more books, but still watching tons of TV... how is this possible? My goal has been to try and read 1 book per month and I have been somewhat on track with that. I'm finishing up the new Bridget Jones book now! 4. Stay organized, purge unnecessary stuff, and keep both my work and living spaces clutter free. An ongoing project. I've become a master of purging. However, I am still a master of shopping so the two seem to cancel one another out. 5. Spend more time with friends and family-- near and far. We had the opportunity to visit with both of our families more than once this year, which we can't often say is the case. We have welcomed old friends back to Chicago and visited even older friends to celebrate weddings this year. However, with 3 weddings of very good friends on the horizon next year, 2014 will definitely be the year of the reunion! 6. Cut more junk food out of our diet (like that nasty high fructose corn syrup), eat healthy, and make exercise more of a priority. Another ongoing project. Are we working on it? Yes. Are we there yet? No. 7. Stay employed at the same firm for the entire year and start plugging away at the ARE to become a licensed architect (Alex). Happy to say that Alex is still working for the same office, although studying for his licensing exams has taken a backseat to his busy work schedule. We can't complain though. Busy is good. 8. Travel as much as we can on as little money as possible. A lofty goal, but I will try to make it work! We got to do some amazing travel this year-- together and apart, for work and for pleasure: We collectively made it to Las Vegas, Rhode Island, Buffalo, Erie, Dallas, Baton Rouge, Milwaukee, Kohler, St. Simon's Island, Madison, San Diego, Newport Beach, and northern Michigan... not bad. 9. Explore the Chicago suburbs (since we hardly ever get out of the city) to get some clarity about where we'd like to move in the future. Well, this is an interesting one. We didn't explore the suburbs at all (except for the few times we had to be out there for work or we were making a run to the outlet mall) because the more we thought about it, the more we don't want to leave Chicago... yet. So instead, we have continued to explore Chicago with the hope that we'll be able to buy our first home (a condo) in the city. 10. Stress less, live in the moment, and enjoy life with each other. Another ongoing project. Life is busy (and just gets busier), so it's difficult to not stress-- especially for someone as prone to anxiety as I am... but life is good. Trellis is the newest offering from Four Corners Tavern, the group behind a few of my favorite sports bars: Sidebar, a downtown lunch staple, Brownstone, Chicago's home for Alex's beloved Longhorn football, and West End where I have enjoyed several brunches, nights out, and New Year's Eve celebrations. The bar is tucked into a quiet block of Racine, just west of the DePaul campus in the old Gaslight (another Four Corners space). Unlike the rest of the Four Corners family, Trellis is less sports bar and more wine bar but with the same consistently good food and a fabulous selection of wine and craft beers in a modern more elegant setting. So, when Trellis invited Alex and me in for dinner recently, I was really excited to give it a try. We were there on a wet and chilly evening, so we decided to warm up with a few glasses of wine and started off our meal by sharing the prosecco cheese fondue. I love the presentation-- it wasn't just a dip, but it was actual fondue served in a little crock over a votive candle with fondue forks. The cheese was warm and melty with a hint of the acidity from the sparkling wine. It was super tasty with the unique dippers they served: apple slices, grapes, pretzel bites, and salami. Alex and I can have very different tastes a lot of the time, so we both picked two more items each from the menu to try. First up, Alex's picks: scallops with pancetta over grits in a sherry brown butter sauce. The sauce had a great flavor from the sherry and butter combo and these were the perfectly little bite of rich scallops in creamy grits-- a great portion for sharing! Not as good for sharing, was Alex's second pick: the chicken noodle soup with fresno chiles. He's not a big soup guy, but he loves some chicken noodle. The fact that this one was kicked up with some heat had his name all over it. I didn't get to sample any of this one, but it had big chunks of chicken, homemade noodles, and smelled delicious. Alex seemed to enjoy it! As soon as I spot Brussels sprouts on a salad, it's almost guaranteed that I am going to order them. These Brussels sprouts were shaved super thin and tossed with chunks of tender pork belly and slices of spicy radish in a tangy vinaigrette. It was a perfect combination of flavors and a great contrast to some of the richer cheesier items we ordered that night too. Last, but definitely not least, my favorite thing that we ordered: the fig jam & bacon pizza. Guys, this was SO good! It arrived last and I was already a little full from the other foods we ordered, but it was so tasty that we polished it off without much of a problem. The pizza crust here is perfect: thin, but not crackery and a great marriage of soft and crispy. The pizza was topped with sweet fig jam and caramelized onions, salty bacon, and tangy blue cheese. A simple and genius combination. I will for sure order this every time I return! I'm definitely looking forward to heading back to Trellis again. It was a great date night spot, but I think it might be even better for a girls' night out. I'd love to come and sip wine with the girls while catching up and sharing a bunch of different items. Welcome to Chicago, Trellis! Also new in Lincoln Park is Summer House Santa Monica, the latest offering from Chicago restaurant group Lettuce Entertain You. The restaurant specializes in lighter California-style cuisine and and the light, beachy decor of the restaurant immediately transports you to the Pacific Coast. Stopping into this restaurant for the first time during a chilly and snowy Chicago winter was especially a treat! How lovely is the enormous glass ceiling? And with the string lights, it felt super festive... like Christmas at the beach! We started out by sharing "a hot mess of fries." With a name like that, how could we not order it? This was basically Summer House's version of poutine: super thick-cut fresh fries topped with braised por, blue cheese, truffle jus, and a fried egg. Yum! It was portioned really well so we weren't super stuffed before our entrees arrived, but still super rich and delicious. For my entree, I ordered the grilled vegetable tacos. It was served as a kind of "create your own" plate with warm corn tortillas and a variety of grilled veggies, slaw, corn pico de gallo, guacamole, and black beans and rice. The vegetables had a simple grilled flavor and paired with all of the other accoutrement, it was a tasty and filling dinner-- especially being totally vegetarian! My sister Emma spotted this cauliflower on the menu and suggested that we order some to share at the table. The cauliflower was roasted and served with candied lemon, breadcrumbs, and Parmesan in a jalapeno pesto. It was spicy and refreshing all at the same time and the soft and crunchy texture of the roasted cauliflower was delicious. Another dish I may try to make at home! To finish things off, we enjoyed a little dessert-- three desserts, to be exact. Alex demanded that we order a slice of the triple chocolate cake. It was served with whipped cream and a little square of peanut butter fudge. It was so rich and chocolatey. Along with the cake, we tried two of their homemade ice creams: Maple Whiskey and Peppermint Stick with homemade hot fudge... the cake was really good, but these ice creams were my favorites by far. The flavors were so fresh and there is really nothing better than homemade ice cream. 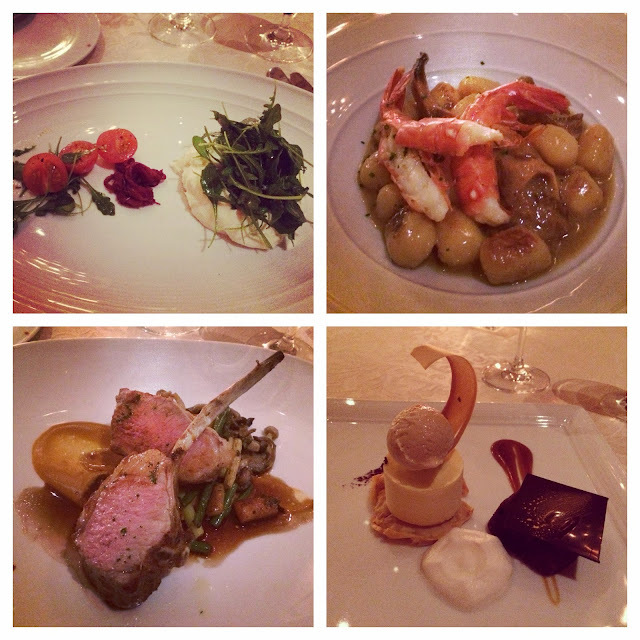 Editor's Note: Dinner at Trellis was provided to us at no charge, however the opinions expressed here are all my own. Happy Thursday! I hope you all had a wonderful Christmas yesterday. 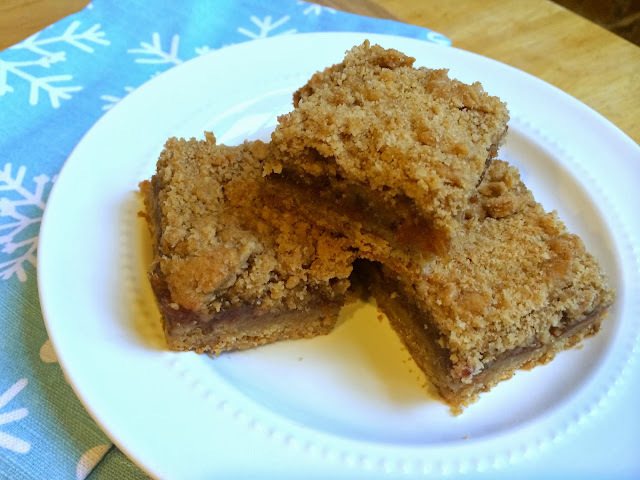 Since everyone was busy celebrating on Wednesday I decided to hold out on posting my usual recipe post until today. I'll be doing the same thing next week since it will be New Year's Day. 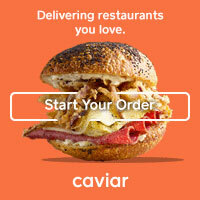 So, look out for a special What's For Dinner [Thursday Edition] next week too! 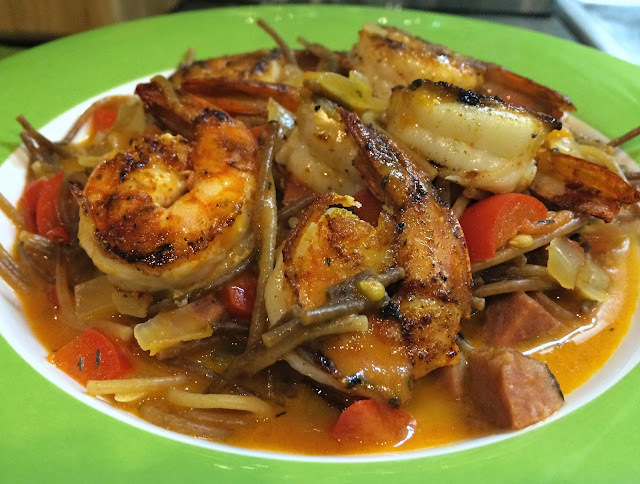 On to this week's recipe: Spanish-Style Fideos with Shrimp & Chorizo. 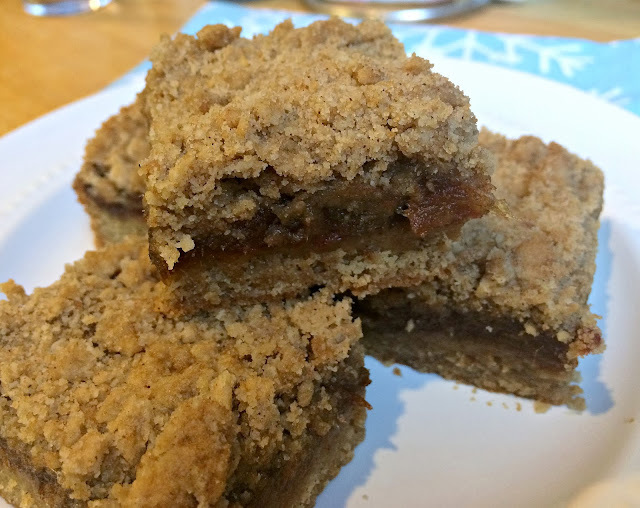 This recipe is based on one of my favorite recipes that Cooking Light has ever published. Back when Alex and I first moved to Chicago I was totally loving having someone to cook for every night. After randomly picking up an issue of Cooking Light in the checkout line one day and giving this recipe a try, I became an instant fan. Over the years, I have made this recipe several times and have tweaked the ingredients and ratios along the way-- the biggest change being that I use shrimp (and scallops for Alex) instead of mussels, which is what the original recipe requires. I don't enjoy mussels, so the shrimp was an easy and tasty swap. This is such a delicious one dish dinner and a super comforting and filling, yet not at all heavy dish. Don't be intimidated by the lengthy directions-- it's really not that difficult to assemble and the brothy sauce, the tender pasta (a.k.a. "fideos," or broken noodles), and the sweet and smoky flavor of all of these ingredients is something really special. In a small saucepan, bring broth and thyme to a simmer. Cover and keep warm on low heat. Heat 1 Tbs. oil in a large saute pan over medium-high heat. Add pasta to the pan and cook 3 minutes or until golden, stirring constantly to prevent burning. Transfer to a bowl and set aside. Add remaining olive oil to the pan over medium-high heat. 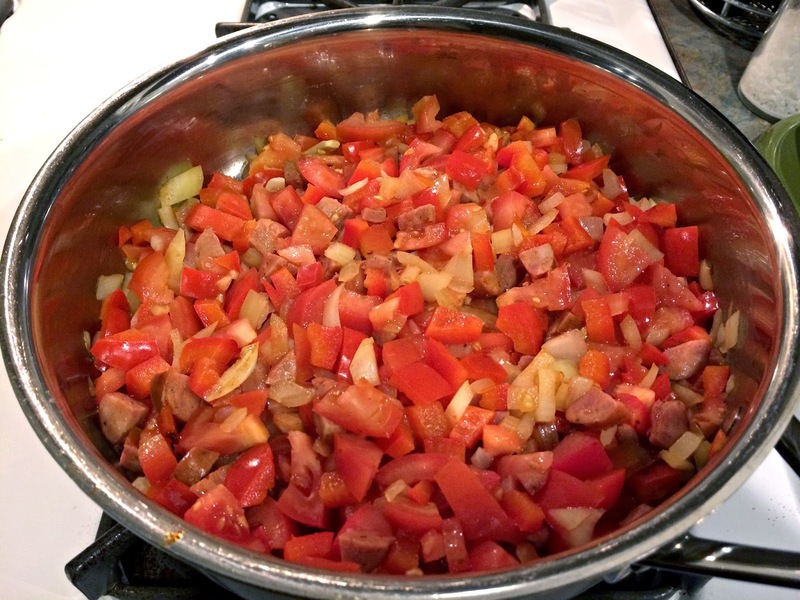 Add onion, bell pepper, chorizo, and garlic to the pan. Sauté for 5-6 minutes or until tender, stirring occasionally. Add tomato, sugar, paprika, pepper flakes, and salt. Cook for 1 minute. Add wine and 1 cup of broth to the pan. Bring to a boil. Add shrimp to the pan and cook for 4-5 minutes or until shrimp begins to curl up and turn pink. Transfer shrimp to a separate bowl with a slotted spoon and keep warm. Return tomato mixture to a boil, then reduce heat and add milk. Simmer until liquid is reduced by about half. Add pasta and remaining broth to skillet. Bring to a boil. Cover and cook for about 5 minutes. Uncover and stir the shrimp back into the mixture. Cook for another 2 minutes or until liquid is absorbed, pasta is tender, and shrimp is warmed through. Serve warm in shallow bowls. Are you planning on doing some entertaining over the next week or two? With Christmas Eve, umm... tonight and New Year's Eve hot on its heels, chances are the answer is "Yes." Well, I would like to help you out with that today. One of my favorite tips for keeping holiday meals low stress is to lay out an array of easy to prepare, no cook snacks and appetizers during the day that people can graze on as you work on the big dinner. My mom and grandmothers have always been great about doing this on the holidays and it has been very successful for me too. Let's face it, you don't want people making sandwiches in the kitchen while you're working, pestering you about dinnertime because they are hungry, and you certainly don't want to spend time cooking up lunch or fancy appetizers when your focus is on the Big Meal. This Thanksgiving I decided to keep my snack spread simple by serving nothing that required cooking or extensive prep, while still offering a wide variety of complimentary items. After discovering this recipe for Whipped Feta on The Law Student's Wife I decided to curate a Mediterranean-inspired appetizer spread around that. And it was a great success! On the day before, I made the whipped feta, sliced the pita bread into triangles, washed and sliced the red peppers, peeled and sliced the cucumber, and washed the fruit. That morning, I toasted the pita bread, sliced the apples (to prevent browning/drying out), and then arranged everything in their places and we were good to go! 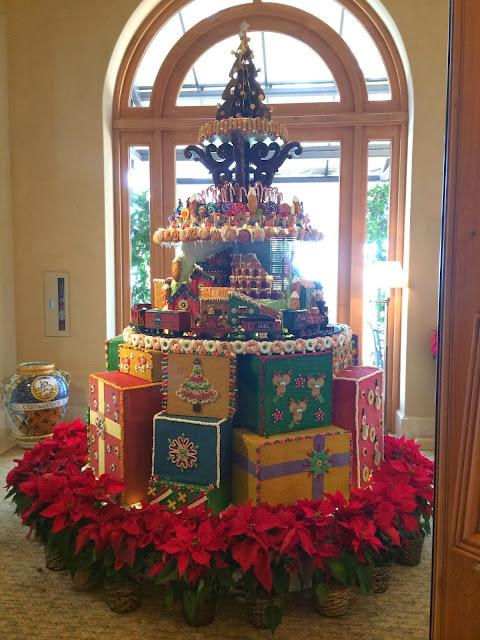 Hope this helps to make your holiday celebrations easier and more delicious! 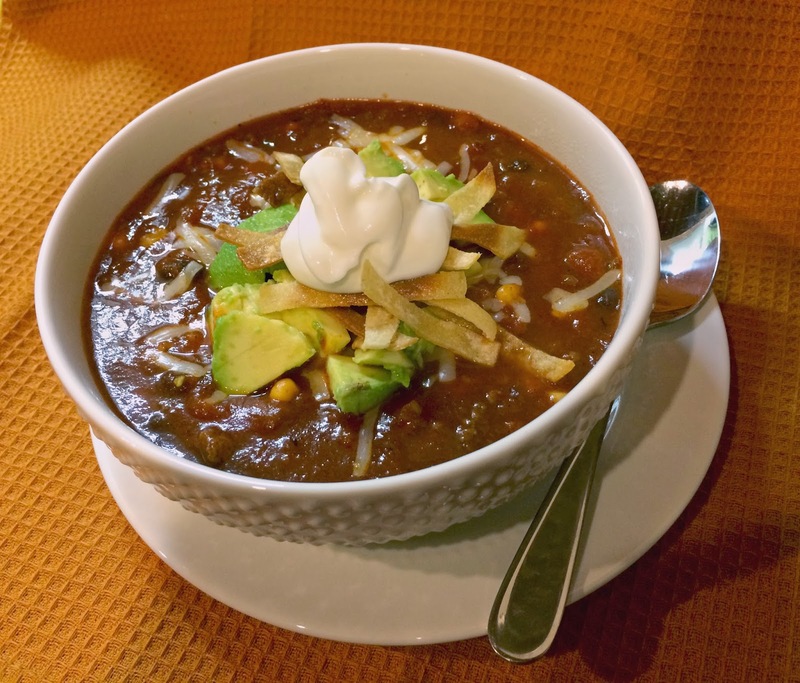 In chilly weather like this, there is nothing better (or easier to make) than a bowl of homemade chili. This chili recipe is so perfect for cold days like this-- it simmers all day in the slow cooker and then a hearty dinner is waiting when for us at dinnertime. 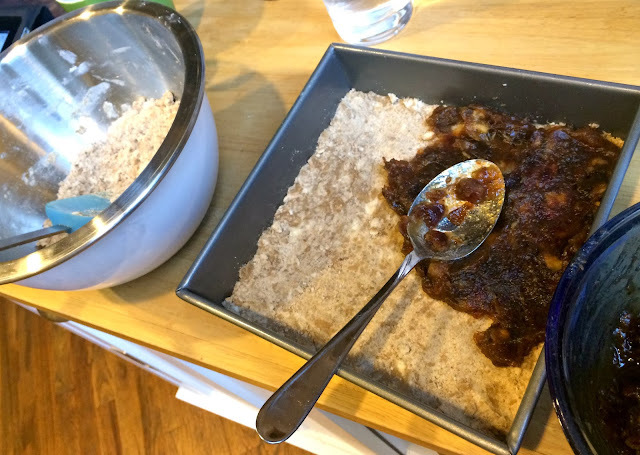 As you know from some of my other Recipe Re-Do posts (like this one and this one), I'm a big fan of making tweaks to my favorite recipes to make sure that they taste a little better every time. This chili recipe received a small makeover recently with just a few ingredient swaps from the original: deeper flavors from a bold IPA and fire roasted tomatoes and amped up heat from Serrano peppers and Mexican-style chili powder. 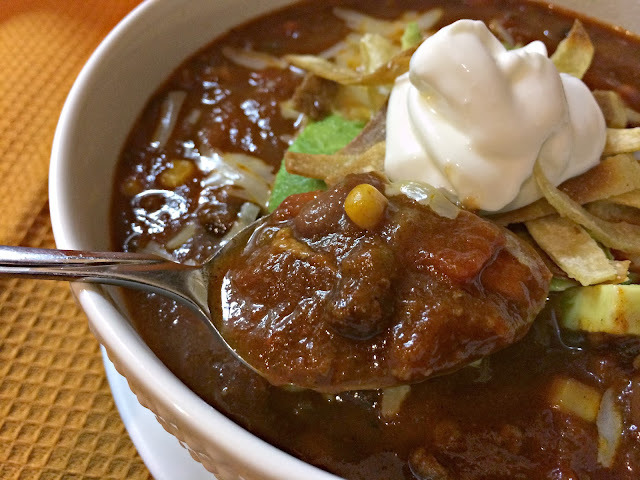 This recipe makes a huge amount of chili: perfect for feeding a crowd or freezing in batches to use for dinner at a later date. I would also point out that-- depending on what you top this chili with-- it's actually a pretty healthy recipe filled with lean and healthy proteins and a ton of veggies. Eat up! 2 bell peppers, seeded and diced *I use red, but you can use any combo of your favorite colors. Heat oil in a large skillet over medium heat. Add onion and peppers and cook until softened, about 5 minutes. Add garlic and saute for another 2 minutes. Add bison to the pan and use a spatula to break it up as the meat browns, stirring frequently. Once the meat is browned, drain excess grease from the pan and pour beer into the bison mixture. Continue to cook, stirring frequently and scraping up brown bits from the bottom of the pan until the beer has reduced by at least half. Pour the contents of the skillet into a large slow cooker. Add canned tomatoes and the following 6 items through the black beans. Stir ingredients well and then fold in frozen corn. Add the remaining spices to the mixture, mix well, cover, and cook on low heat for 6-7 hours. Periodically remove the lid and give the mixture a quick stir. After a few hours of cooking, taste a spoonful of chili and add additional seasoning as needed. Serve with the sides and toppings of your choice: With cornbread, tortilla chips, or over pasta (like my husband likes it). Other great toppings include: Avocado chunks, guacamole, sour cream (or plain Greek yogurt), shredded cheese, shredded lettuce, or thinly sliced radishes. Last week I told you about a few of my favorite things to do during the holiday season in the mostly underrated Chicago Loop. 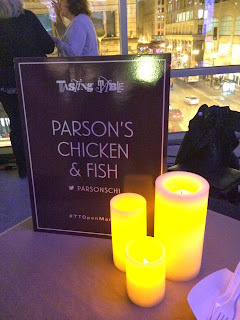 Today, I want to tell you about two fun food events that recently took place in the heart of the Loop at Block 37. 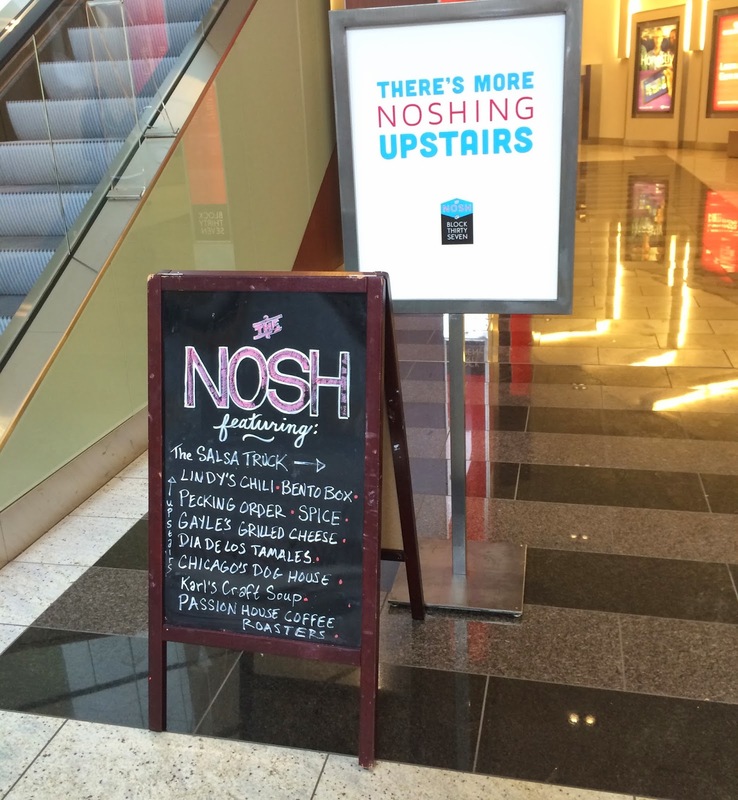 The Block 37 mall is newer to the State Street shopping scene and was recently the host location for both The Nosh and the Tasting Table Open Market events. I have always wanted to go to The Nosh-- an amazing collection of restaurants, food trucks, and "small-batch food purveyors" that set up shop every weekend in Wicker Park for Chicago food lovers. It's like a farmers market for prepared foods. They have more recently been setting up at the Logan Square Farmers Market and it has been one of those things that I said "I'll get around to going" and then I never did. Well, last week I got my chance. For one week only, the Nosh took up residence at Block 37 and I took advantage of its close proximity to my office and headed on over for a delicious workday lunch. 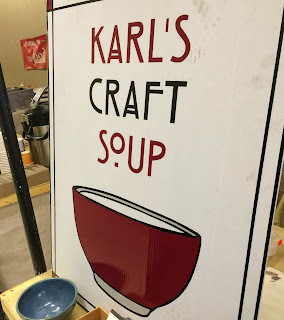 It was frigid that day so when I spotted Karl's Craft Soup I knew exactly what I wanted. One of the two soups he was selling that day was a Szechuan Carrot Sesame Soup and it was so delicious-- sweet from the pureed carrots with a good amount of heat and a hint of that nutty sesame flavor. 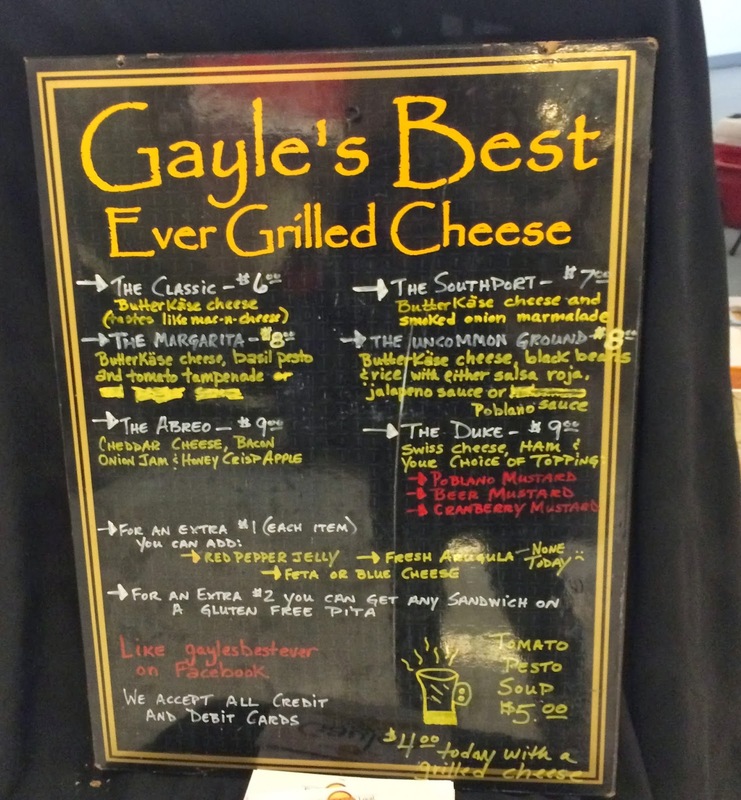 I rounded out my lunch with a sandwich from Gayle's Best Ever Grilled Cheese. 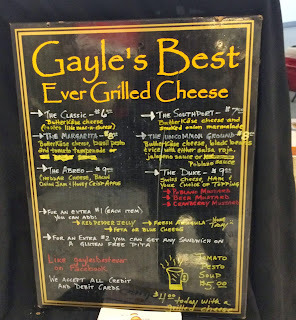 I ordered The Southport, a grilled cheese with smoked onion marmalade-- the perfect sweet compliment to my spicy soup. A lunch win! As if The Nosh wasn't tasty enough, I brought Alex over to Block 37 for a Friday date night at the Tasting Table Open Market recently too. This was a really fun and unique event celebrating food-- specifically, local chefs, restaurants, and artisans. Are you sensing a theme here? The event space on the third floor of Block 37 was done up in its holiday best that evening with twinkle lights, trees, and pointsettias around the room. It was so pretty and festive. At the event we had the opportunity to sample a variety of different foods from tons of vendors around Chicago-- some we had heard of and some that were new to us. When he spotted the Fish Bar table, Alex made a beeline for it. The man loves a lobster roll and Fish Bar's is one of his alltime favorites. They were serving up adorable mini rolls that evening-- perfect for getting just enough lobster and saving room for tasting other treats! I was excited to see a Parson's Chicken & Fish table. It's a restaurant that has been on my 'must try' list for a while, so getting a little sneak preview of their food was wonderful! I tried their chicken biscuit-- spicy saucy chicken over a warm biscuit with a little aioli on top. Delicious! New to me was Pecking Order-- and I am so glad we checked it out! Their restaurant is in Uptown, a neighborhood I don't often spend time in so I had never even heard of this place. We agreed that the Pinoy Egg dish that we ordered was our favorite thing that we ate all night. This two part dish was a soft boiled egg wrapped in risotto, breaded, and fried with a spicy sauce on top accompanied by adobo pork that received the same fried risotto crust. Wow! So glad we discovered Pecking Order and looking forward to popping into their restaurant! But wait, there's more-- Just when you thought we were done, we continued eating! When I walked by the Longman & Eagle and noticed what they were serving that night I had to give it a try. Roasted pork cheek over homemade pasta in a fontina mornay sauce topped with shaved Brussels sprouts. It was as rich and delicious as it sounds! Tito's Handmade Vodka was serving up a great seasonal cocktail that I was happy to sip on all night. 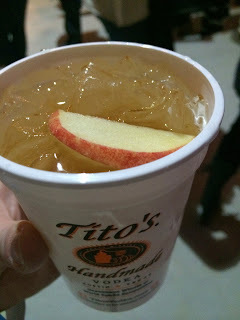 A combination of vodka, caramel liqueur, apple juice, and lemon, it was like a really refreshing apple cider. 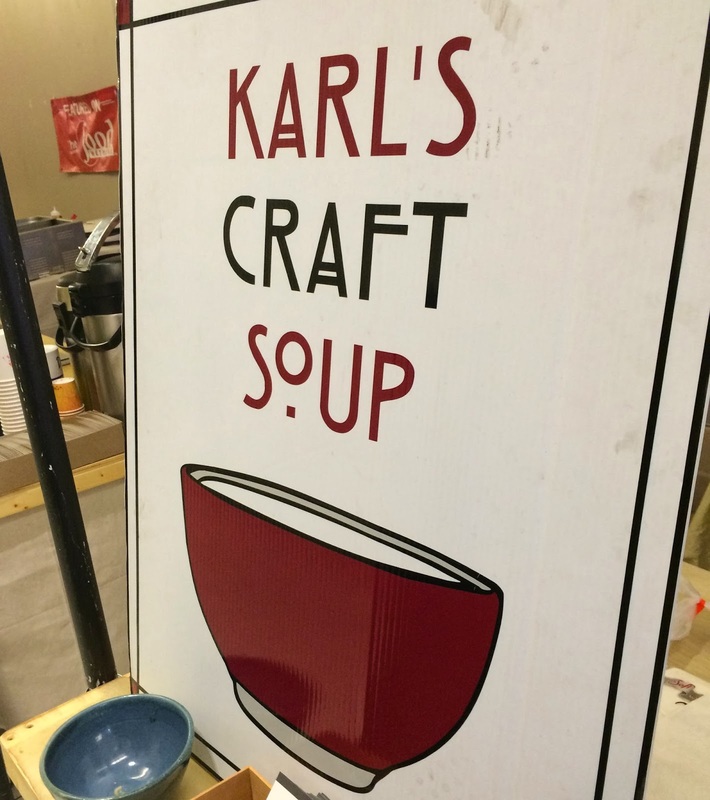 This event was also a great way to discover some local food vendors that aren't necessarily restaurants-- perfect for a little holiday gift shopping or to just find fun ideas to take home and eat or cook with. We stopped by Floriole Cafe & Bakery's table to check out their spread of amazing baked goods. We left with a Canelé de Bordeaux (a rich vanilla rum cake) and a triple chocolate brownie. So. good. Lastly, I wanted to tell you about Le Sirop, a syrup perfect for mixing into your craft cocktails. Femme du Coupe was serving it up their Lavender Honey variety with fresh lemon juice and water. 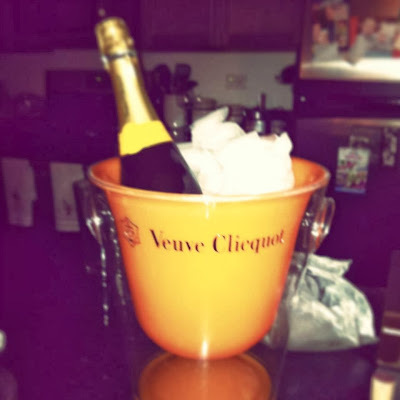 I grabbed a bottle thinking it would be great coupled with some prosecco or St. Germain. 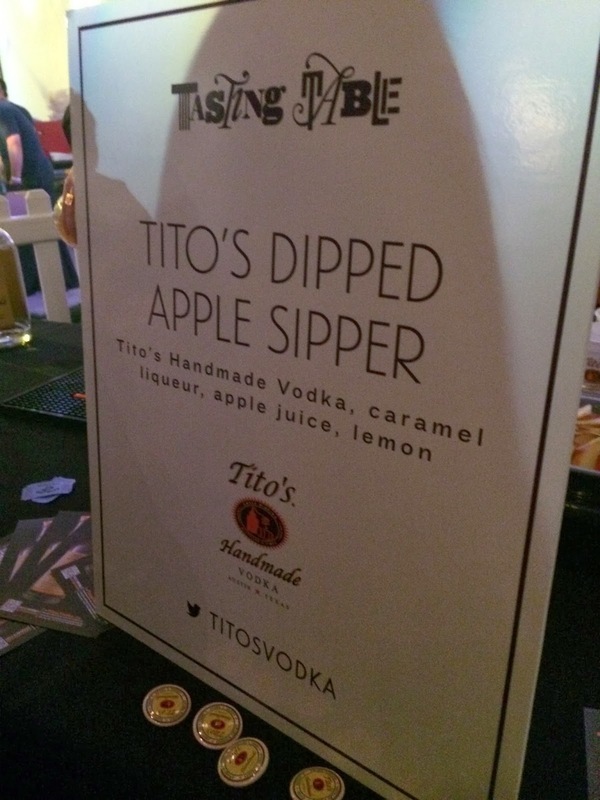 To learn more about Tasting Table and any of their upcoming events, check them out here! Editor's Note: Admission to this event was provided to me at no cost, however all of the opinions expressed here are my own.